Discover how you can emulate the Duchess of Sussex’s style at home and give your interiors the royal treatment. Meghan Markle – humanitarian, gender equality campaigner, former Suits actress and now-member of the royal family – has long been making her mark on fashion. Proving her selling power, Meghan’s wardrobe has led to frenzied shopping at tills and online checkouts, and with the announcement that she and Harry are expecting their first baby in spring 2019, her choice of maternity wear is set to have the same effect. But it’s not just fashion because her style is influencing home decor too. The Duchess of Sussex’s fashion style is one that seamlessly overlaps with interiors; it’s a style that defines the trend for everyday luxury, reflecting laid back elegance that is both timeless and chic. Fashion and interior design have always been known to cross paths and influence one another. Interior designers look at fashion trends of the past to inspire them with their interior design plans, and most of the time, this is how great interior trends are made. There’s no doubt Meghan has put her stamp on Nottingham Cottage, the two-bedroom house on the grounds of the Kensington Palace estate, she currently shares with husband Prince Harry, the Duke of Sussex. 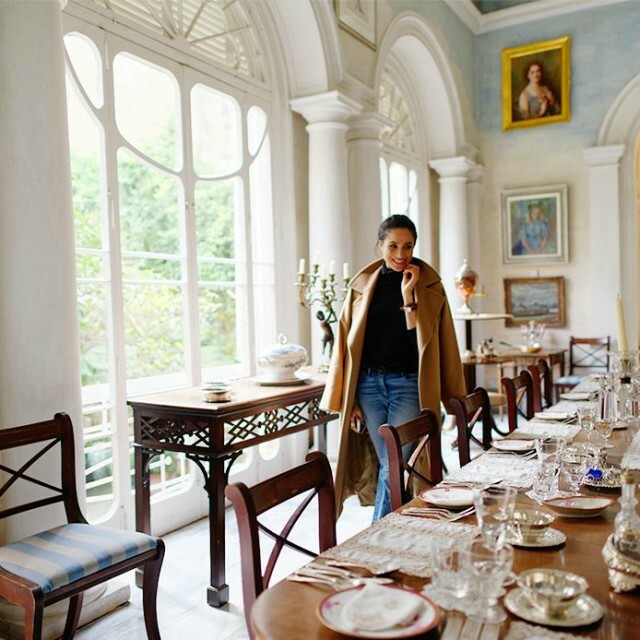 And her interior style – elegant and chic, modern and feminine, and cosy and inviting – is sure to be replicated when the couple move to their new apartment at Kensington Palace. For anyone wanting to give their home a touch of the royal treatment, we’ve compiled a range of Meghan-style paint colours. 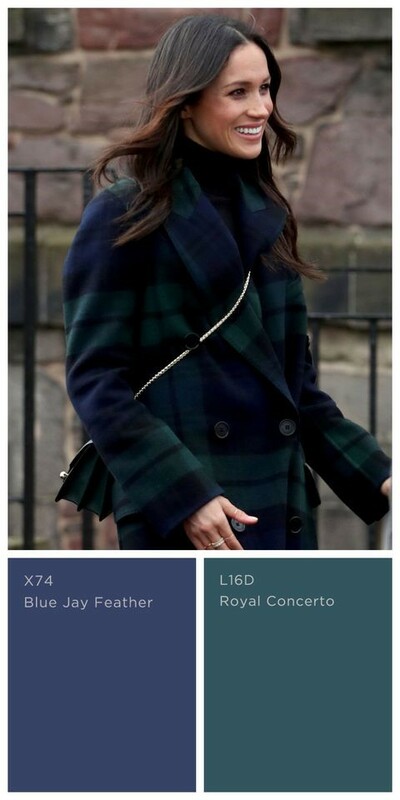 The regal colour palette takes inspiration from some of Meghan’s best fashion looks, which in turn will help to give your walls and ceilings ‘The royal seal of approval’. The Royal Wedding may be over, but Meghan fever is still running high, and with her understated style making waves in the fashion world, this influence can also be used when it comes to interior design schemes. Meghan seems to stick to a clean, neutral colour palette, she also oozes sophistication, and this is something we can easily replicate in our homes. Soft beige’s such as Cappuccino Foam and Cathedral Morning create a smooth base colour and would work well in larger rooms to help bounce light around. To create a dramatic space, use regal shades like Royal Concerto or Blue Dusk, which pair together to beautifully replicate traditional Scottish tartan, a favourite with the royal family. The key to emulating Meghan’s style in your home is to ‘keep it simple’, offsetting glassware, statement furniture and textured accessories with sophisticated shades. 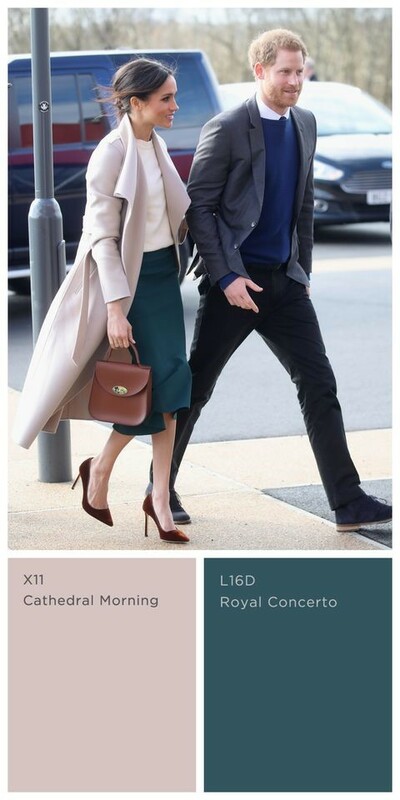 You can even ‘create your very own Meghan-inspired hue’ by mixing your own colours together to see what you come up with. What is the Markle Style? Meghan is all about Danish-style hygge – a quality of cosiness, conviviality and wellbeing – using cool, monochrome colours layered with sumptuous throws and feather-filled comfy cushions. Her favourite selfie spots were set around her deep, wide white linen sofa cushions, or on her simple wooden-framed bed which is adorned with soft white linen, probably 800-plus thread count Egyptian cotton. Other selfies showed her reflected in her large, smoked-glass, panelled statement gilded mirror which was in her Canadian living room. Fluffy sheepskin throws are draped over treacle-toffee-coloured rattan chairs — she would sit in one with her feet up on the other. Wicker baskets are filled with logs, while a faux-cowhide rug, sometimes on a patterned Moroccan-tiled floor, adds a luxurious touch. 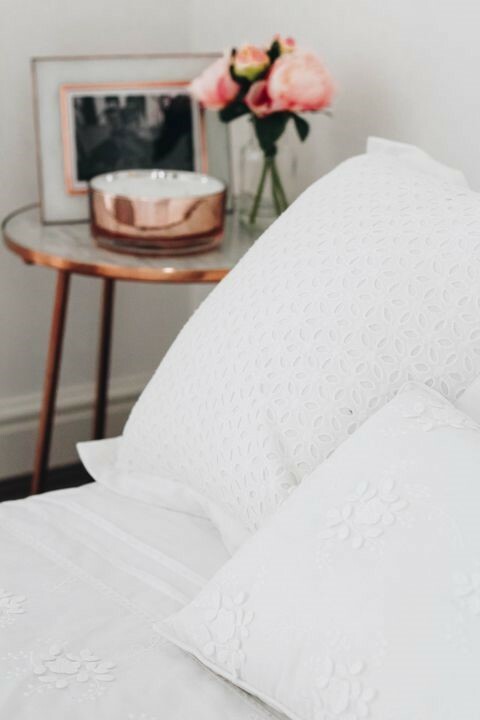 We learned a lot from Meghan’s now-deleted lifestyle blog and Instagram account – from her favourite peonies that make her ‘so endlessly happy’, to white bed linen, metallic photo frames and, scented candles. This year, many supermarkets and department stores were helping customers achieve the Meghan Markle home look on a budget, with collections including flowers, white bed linen and metallic and textural accessories, such as photo frames and vases. 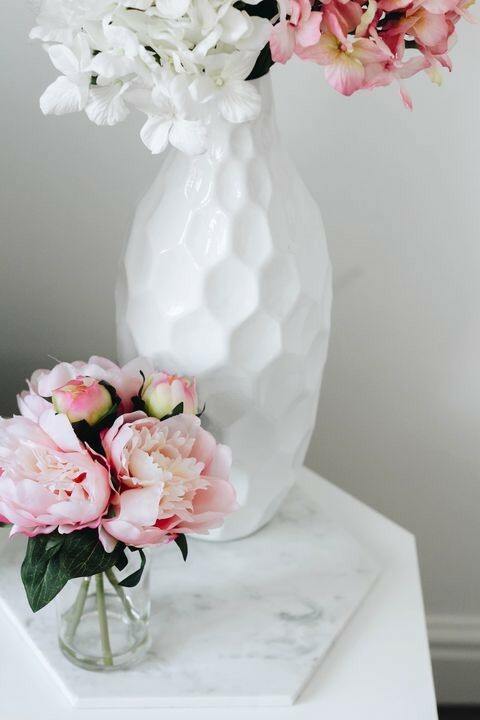 By exploring the Meghan Effect in garden trends, we’ve been able to see how her wedding bouquet – and her love for peonies – have impacted plant trends. 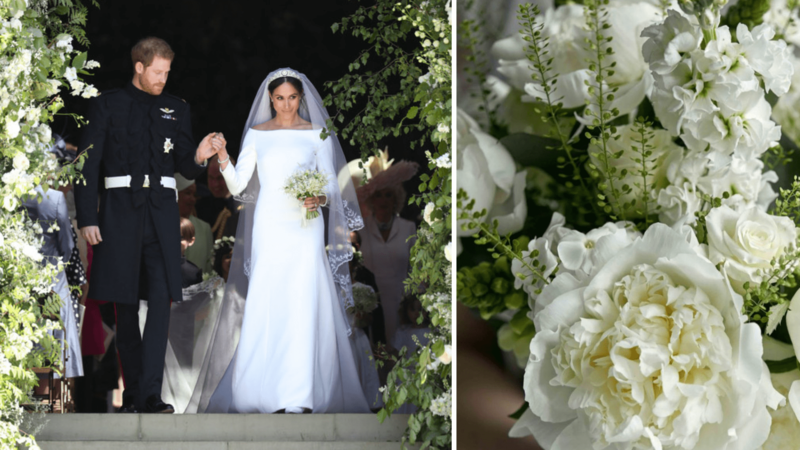 Case in point: Before and after the wedding, the peony – which has a short flowering period (it blooms from April to early June) – was everywhere, from wedding flower bouquet to ‘The Meghan’ bouquet. It can be seen that peonies are currently amongst social media’s most photographed flowers, as well as roses, zinnias, dahlias and hydrangeas. Meghan’s love for peonies and the chosen flowers for her wedding bouquet influenced many limited-edition floral arrangements and replicas. Does this mean every household up and down the country will paint their home in regal shades and fill their vases with peonies? Meghan is a powerful influencer and there’s certainly an element of aspiring to ‘get the look’ or ‘achieve the style of’ which is filtering down from fashion through to interiors. What is becoming evident is how brands are making connections using Meghan’s new status as a member of the royal family and packaging these in a way that’s appealing to consumers and is somewhat reflective of the lifestyle some may aspire to. What will Meghan influence next?